A wrongful death claim is a type of lawsuit brought by a deceased person’s loved ones or family. This is possible only if the death resulted from another person’s intentional act or carelessness. There is no amount of money that can ease the pain of losing someone, but you have a right to hold the offender accountable. You’re also entitled to gain some form of compensation for the loss you suffered. The suit is filed against the individual considered responsible for the death, but a wrongful death claim needs enough proof if it is going to be successful. While that is the case for all these lawsuits, the different types of wrongful death claims can vary greatly. Who Can Make a Wrongful Death Claim, and What Must They Be Able to Prove? A wrongful death claim can be filed by people who had some kind of relationship with the deceased person. The specific types of relationships considered acceptable depend on the state you’re located in. However, there are some definitions that are consistent in every state. For example, a spouse can make a wrongful death claim on behalf of their deceased partner. Parents of underage children can also do so if their offspring were killed. Likewise, minors can seek compensation for the death of their parents. In certain states, any person with financial dependence on the victim has a right to make a claim. The individuals making the wrongful death claim need to prove that the person they’re suing is at least partially responsible for the victim’s death. If negligence is the charge, they must have evidence that the defendant’s carelessness caused the death. They must also be able to provide proof of monetary losses that have resulted from the death. These losses would be one of the primary reasons for seeking compensation. 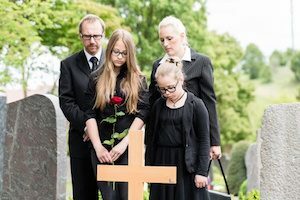 What Are Some Examples of a Wrongful Death Claim? The wide range of wrongful death claims means that you might be entitled to compensation for the passing of your loved one without being aware of it. If you’re unsure about whether you can legally proceed with a lawsuit, you should seek out the assistance of an attorney. A lawyer with a good track record is more likely to help you get the compensation you deserve for the loss of your loved one. Learn more about wrongful death claims by contacting our legal team at Williams & Williams, LLC today.